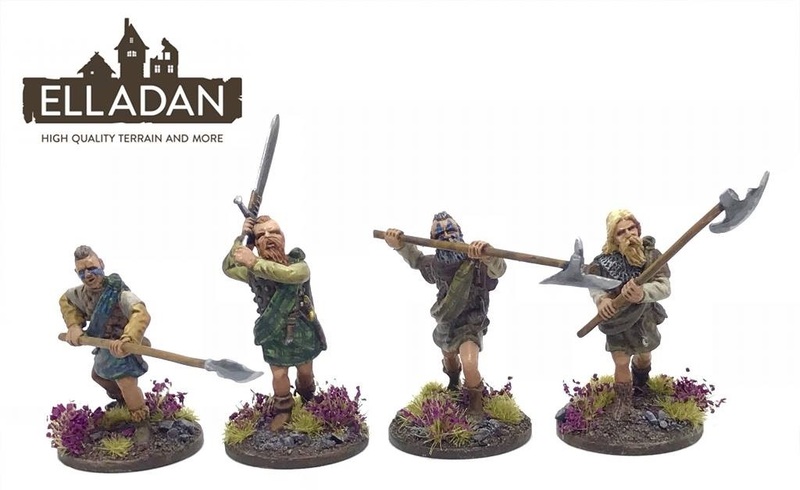 In the Scottish range at Elladan, you'll find a second set of 28mm veterans for Saga. They look … ok. The sculpting seems a bit meh. I see a Gibson influence. Oh lordy….a new set of Confederate Zombie SS Templar commandos. Please don't buy this sort of thing; it just encourages people to make more. Maybe they are veterans of a thousand psychic wars? Or refugees from Atlantis? Or maybe from the Muppets? They're Braveheart Scots. They'd make a nice fantasy barbarian army. They're not too bad, main improvement would be making the lower part of the plaid fuller/looser. These look more like mini skirts. It's also obvious the sculptor doesn't know much about belted plaids given the location of the pouches and scabbards. Indeed…marketing them as 'fantasy barbarians' would be perfectly sensible; claiming that they are a valid choice for medieval Scotland is not. All that's wrong with them for the middle ages is the clothing,the weapons and the haircuts; apart from that they're fine. There's plenty of very suitable figures available – Claymore, Foundry, Essex come to mind. The thing about the shaved sides of the heads is that this seems to be a trope these days about the Picts due to the way hair is represented on the stones. You only need look at the weird way helmets are depicted to realise that the hair was not likely shaved on the sides but is the local convention for carving it – they weren't the best sculptors unfortunately.